You need to install Azure CLI 2.0 on your agent (for Windows, it’s a .MSI file). Upgrade fails with TF246017: Team Foundation Server could not connect to the database. Caught exception in ExecuteScripts: Microsoft.TeamFoundation.Framework.Server.DatabaseConnectionException: TF246017: Team Foundation Server could not connect to the database. Verify that the instance is specified correctly, that the server that is hosting the database is operational, and that network problems are not blocking communication with the server. —> System.Data.SqlClient.SqlException: Cannot open database "Tfs_DefaultCollection" requested by the login. The login failed. [12:44:29.207] Login failed for user ‘SERVERTOGO\TFSSERVICE’. While this error message can have multiple causes (invalid credentials, SQL Server not available/not started, etc. ), it was strange that it failed during the upgrade process (which means many steps were already successfully executed against that SQL Server instance). The Windows Event Log is a good candidate where to look for the potential cause. In this case, SQL Server told me that it stopped a transaction, because the transaction log was full. 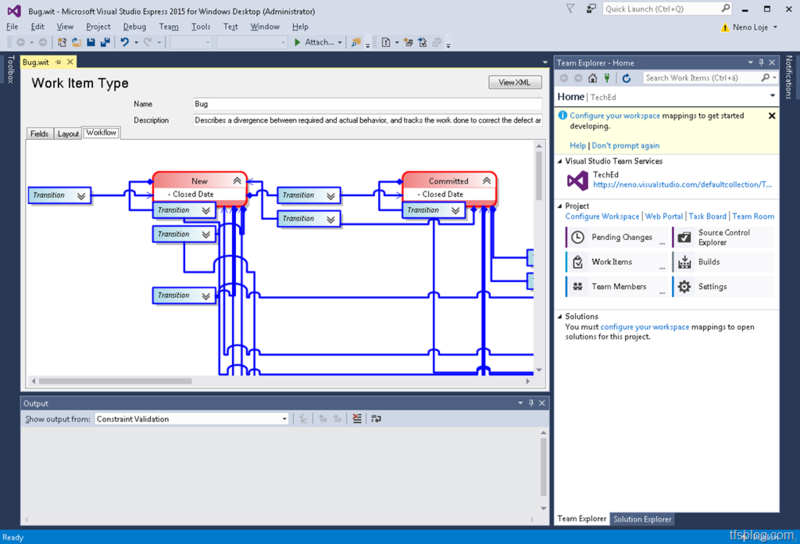 Increasing the maximum size of the Transaction Log (in SQL Management Studio) resolved the issue. Q: Where to get the Process Template Editor? The Process Template Editor that you can use to export/import work item types of existing team projects as well as modify or create your own process templates, is a separate download and made available as part of the TFS 2015 Power Tools. 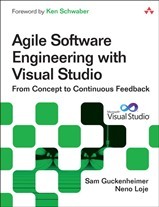 As the Process Template Editor is a plug-in to Visual Studio, you need at least a Visual Studio Express Edition (all higher Editions are equally good) installed. 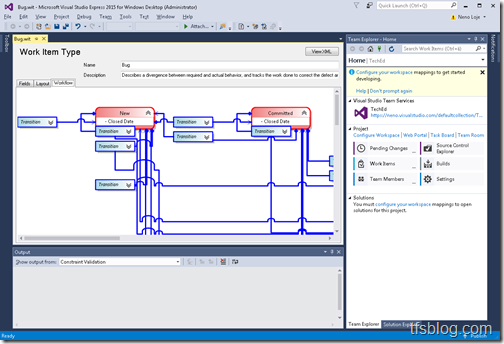 Figure: Process Template Editor running in VS Express for Windows Desktop. /Library/Frameworks/Mono.framework/Versions/4.2.3/lib/mono/4.5/Microsoft.Common.targets: warning : Project reference ‘../HelloWorldApp/HelloWorldApp.csproj’ could not be resolved. AppDelegate.cs(26,33): error CS0246: The type or namespace name `App’ could not be found. Are you missing an assembly reference? Remove references to the project that could not get resolved (in the example above, it’s a portable class library HelloWorldApp.csproj) and put them back in (as project reference). Q: What permissions do I need to rename a Team Project? Answer: Users need the “Edit project-level information” permission to rename a team project. By default the Project Administrators group has that permission. Q: What are the possible expressions for the “Test Filter criteria” parameter? Q: How to enable screen video recording when running functional tests on a Test Agent? Answer: On the “Run Functional Tests” task, you can specify a .testsettings file in the “Run Settings File” parameter. Q: What software versions are installed on VS Team Services’ hosted build agents? Answer: As you have no influence as to what software gets installed on the Hosted Agent that is provided as part of VS Team Services, it’s important to know what is currently installed. The type ‘Microsoft.TeamFoundation.Framework.Client.ILocationService’ cannot be used as type parameter ‘TService’ in the generic type or method ‘VssRequestContextExtensions.GetService<TService>(IVssRequestContext)’. There is no implicit reference conversion from ‘Microsoft.TeamFoundation.Framework.Client.ILocationService’ to ‘Microsoft.TeamFoundation.Framework.Server.IVssFrameworkService’. ILocationService exists in two namespaces. Make sure you use Microsoft.VisualStudio.Services.Location.Server.ILocationService (from Microsoft.TeamFoundation.Framework.Server.dll). Q: How can I use an TfsTeamProjectCollection to authenticate against the REST API (*HttpClient)? 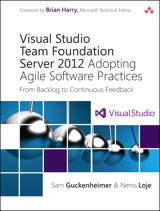 Answer: If you are already authenticated against the “classic” TFS Object Model from the Microsoft.TeamFoundationServer.ExtendedClient NuGet Package (typically having an instance of TfsTeamProjectCollection), you can use its GetClient<T> generic method to aquire an *HttpClient class from the REST API.